Charlotte’s heavy clay soil compacts very easily. The small particle size of clay soil results in compaction which limits air, water and valuable nutrient movement to the root system. Soil conditions are actually the most important factor for healthy turf. Our clay soil contains very little organic material; another obstacle for growing healthy lawns. At Plant It Earth we offer core aeration services. We always double pass each lawn concentrating on high traffic areas and areas bordering streets, driveways and sidewalks. 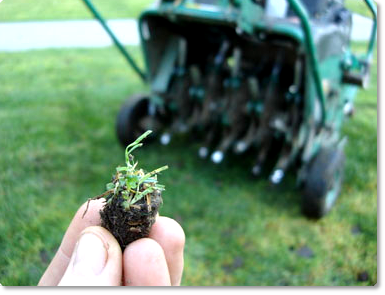 Our equipment removes small plugs of soil allowing better penetration of air, water and nutrients to the root zone. We recommend annual aeration for all lawns in Charlotte due to the clay soil found in our area. Lawns should be aerated when the root system is most actively growing. Tall Fescue lawns should be aerated in the fall (Sep-Oct). Core aeration is a great way to prepare a fescue lawn for over-seeding. Bermuda and Zoysia lawns should be aerated in the late spring, early summer (mid-May thru Jun). Your technicians will inform you of the proper time to perform aeration. - Increase the activity of soil microorganisms that decompose thatch. - Increase water, nutrient and oxygen movement into the soil. 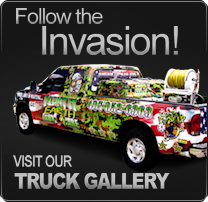 - Help prevent fertilizer and pesticide run-off from overly compacted areas. The most important benefit of aeration however, is the satisfaction of having a thick, rich carpet of healthy grass.